The Daffodil symbolizes rebirth, new beginnings, new hope and life and unrequited love. It is one of the first flowers of Spring and is associated with St. David's Day which is celebrated on the 1st March. As well as being known as the national flower of Wales, it is associated with the tenth wedding anniversary. In the UK the Daffodil is also associated with Mother's Day which falls in March when the Daffodils are at their best and children have traditionally given their Mothers a bunch of Daffodils on Mother's Day. 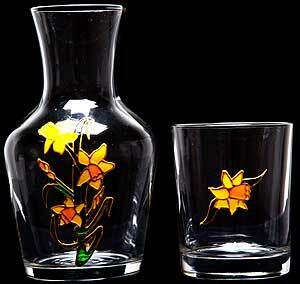 Our Daffodil design makes a beautiful gift for anyone with Welsh associations, a tenth wedding anniversary, a Mother's Day gift, Easter or someone who just loves this beautiful Spring flower.